Hi Mountain's sincere desire is for people to enjoy wholesome and delicious food that has the great flavor of the Old West, made in their own home. 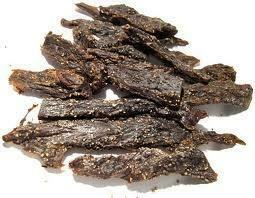 Hi Mountain Jerky uses the best ingredients to make the best products for you. 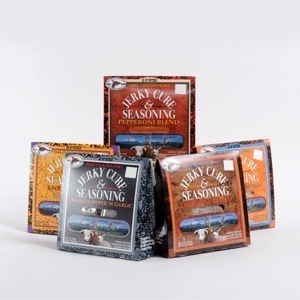 Gourmet Seasonings with Western Flair! 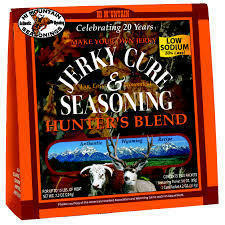 I received a sample of Hi Mountain jerky's Hunter's Blend jerky kit to review. Hunter’s Blend is a special combination of seasonings that feature garlic, pepper , a hint of hickory and finishing with some heat. It will be easily recognized by its unique camouflage-and-hunter-orange packaging, which celebrates its name and the core customer base of Hi Mountain Seasonings. My Experience: My brother-in-law is an avid hunter, and just a couple of weeks ago, he got himself a 500lb elk. I gave him the Hunter's Blend jerkey seasoning kit that I received for an early Christmas gift. Mike had usually made his own jerky seasoning blend in the past and did not believe that anything could taste better than his 'own recipe' until he whipped up a batch of elk jerky using Hi Mountain's Hunter's Blend. I got to try some and man, it is probably the best tasting jerky recipe I have ever tried! It is the perfect blend of tangy, mouth-watering spices. I think Mike agrees, because he asked me where I got it and he plans on buying a bunch of it!